Broadly conceived, literature consists of aesthetic and cultural processes that can be thought of as forms of translation. By the same token, translation requires the sort of creative or interpretive understanding usually associated with literature. Literature as Translation/Translation as Literature explores a number of themes centred on this shared identity of literature and translation as creative acts of interpretation and understanding. 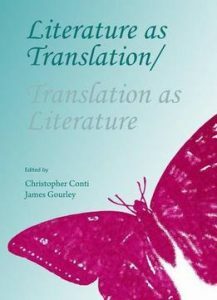 The metaphor or motif of translation is the touchstone of this volume, which looks at how an expanded idea of translation sheds light not just on features of literary composition and reception, but also on modes of intercultural communication at a time when the pressures of globalization threaten local cultures with extinction. The theory of ethical translation that has emerged in this context, which fosters the practice of preserving the foreignness of the text at the risk of its misunderstanding, bears relevance beyond current debates about world literature to the framing of contemporary social issues by dominant discourses like medicine, as one contributor’s study of the growing autism rights movement reveals. The systematizing imperatives of translation that forcibly assimilate the foreign to the familiar, like the systematizing imperatives of globalization, are resisted in acts of creative understanding in which the particular or different finds sanctuary. The overlooked role that the foreign word plays in the discourses that constitute subjectivity and national culture comes to light across the variegated concerns of this volume. Contributions range from case studies of the emancipatory role translation has played in various historical and cultural contexts to the study of specific literary works that understand their own aesthetic processes, and the interpretive and communicative processes of meaning more generally, as forms of translation. Several contributors – including the English translators of Roberto Bolano and Hans Blumenberg – were prompted in their reflections on the creative and interpretive process of translation by their own accomplished work as translators. All are animated by the conviction that translation-whether regarded as the creative act of understanding of one culture by another; as the agent of political and social transformation; as the source of new truths in foreign linguistic environments and not just the bearer of established ones; or as the limit of conceptuality outlined in the silhouette of the untranslatable-is a creative cultural force of the first importance.